To build apps and other things with Ruby on Rails, we need to setup some software and the developer environment for your computer. Follow the instructions for your operating system. If you run into any problems, don’t panic. Inform us at the event and we can solve it together. 1. 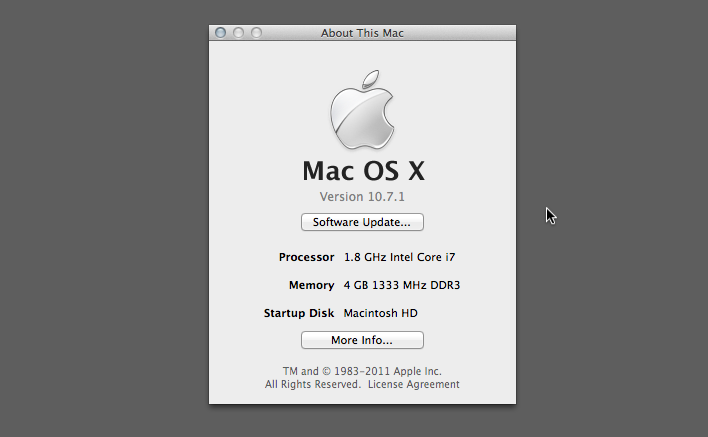 Let’s check the version of the operating system. 2. In the window you will find the version of your operating system. If your version number starts with 10.6, 10.7, 10.8, 10.9, 10.10, 10.11 or higher this guide is for you. If it’s something else, we can setup your machine at the event. If your version number starts with 10.9, 10.10, 10.11 or higher, follow these steps. We are installing homebrew and rbenv. You can find the newest version of Ruby with the command “rbenv install -l”. If you got “OpenSSL::SSL::SSLError: … : certificate verify failed” error, try it this way. Double click the downloaded file and it will unpack it into the current directory. Double click the the newly unpacked ‘RailsInstaller-1.0.4-osx-10.7.app’ or ‘RailsInstaller-1.0.4-osx-10.6.app’ and follow the instructions. It will open a README file with ‘Rails Installer OS X’ at the top. Please ignore the instructions in this file. If the Rails version wasn’t the latest, you could update it using a following command on terminal. 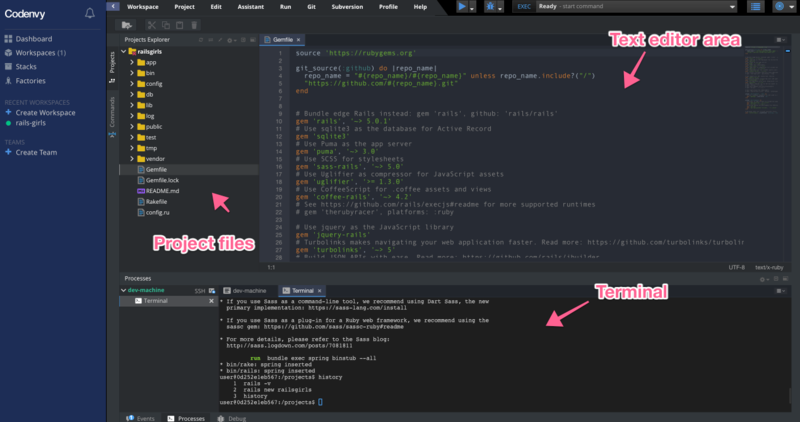 For the workshop we recommend the text editor Atom. If you are using Mac OS X 10.7 or older versions, you can use another editor Sublime Text 2. Just to make sure that you’re not mixing up using your terminal or text-editor: change the theme of your Sublime text-editor, choosing one of the following: “iPlastic”, “Slush & Poppies”, or “Zenburnesque”. Check that everything is working by running the application generator command. Go to http://localhost:3000 in your browser, and you should see the ‘Yay! You’re on Rails!’ page. Now you should have a working Ruby on Rails programming setup. Congrats! Coach: We recommend to verify by using the scaffold command and inputting data with the generated page with coaches to ensure everything is working. Also: remove the test app myapp to make super sure no-one is working in the wrong folder, following the steps of the workshop. Download RailsInstaller and run it. Click through the installer using the default options. To paste a text in the command prompt window you’ll need to use the mouse (right-click on the window –> paste). Make sure it is equal or higher than 2.6.11. Re-run the command that was failing previously. If you are still running into problems you can always find the latest version of rubygems online at rubygems.org. If you click on GEM you will get the latest version. The Gem::RemoteFetcher::FetchError: SSL_connect can also occur during the bundle install stage when creating a new rails app. The error will make mention of bit.ly/ruby-ssl. What is relevant for Windows users at this point is this GitHub gist. The described manual way has proven to be successful to solve the bundle install error. After you did that, please use your Command Prompt again and type bundle update. Download an atom zip file for windows and decompress it. Copy the folder into your Program Files. Launch atom in the folder. If you are using Windows Vista or older versions, you can use another editor Sublime Text 2. Just to make sure that you’re not mixing up using your command prompt or text-editor: change the theme of your Sublime text-editor, choosing one of the following: “iPlastic”, “Slush & Poppies”, or “Zenburnesque”. Make sure it is displaying version number. To install the Ruby on Rails development environment you just need to copy the line below for your Linux distribution (Ubuntu or Fedora), paste it in the Terminal and press Enter. Enjoy the text flying on the screen; it will take quite some time. Grabbing a refreshing drink before starting is encouraged. If you are going to use RVM installations with gnome-terminal, you’ll probably need to change it’s default options before you can see and use the right Ruby and Rails versions. Find out how: RVM documentation. Make sure that all works well by running the application generator command. For the workshop we recommend the text editor Sublime Text. Download Sublime Text and install it. Just to make sure that you’re not mixing up using your terminal or text-editor: change the theme of your Sublime text-editor, choosing one of the following: “iPlastic”, “Slush & Poppies”, or “Zenburnesque”. Instead of installing all tools on your machine, you can also set up a development environment in a Virtual Machine. Please find all the details here. Instead of installing Ruby on Rails and an editor on your computer, you can use a webservice for development. All you need is a browser and an internet connection. 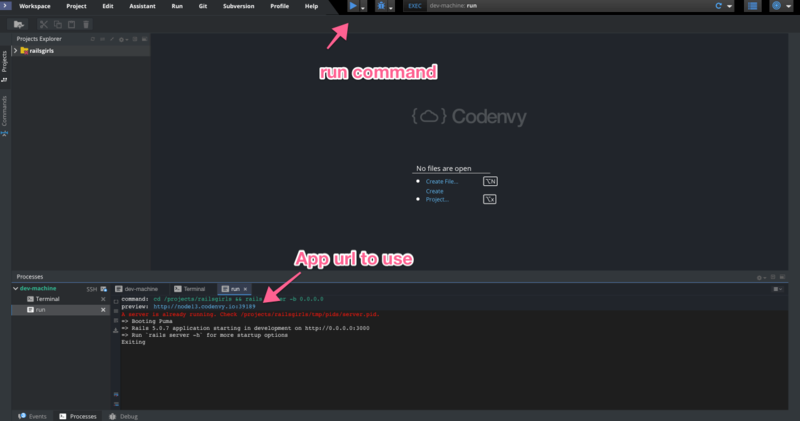 This guide explains how to get started with codenvy.io. If you’re using a different service, they may use a different wording, but the process is usually pretty similar. 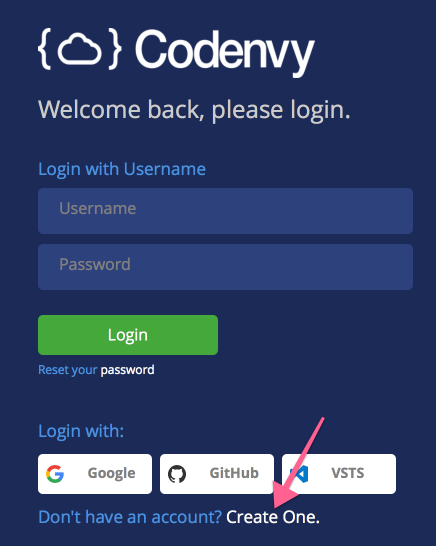 Go to codenvy.io and signup for free. You will need to confirm your email and then fill in your details. 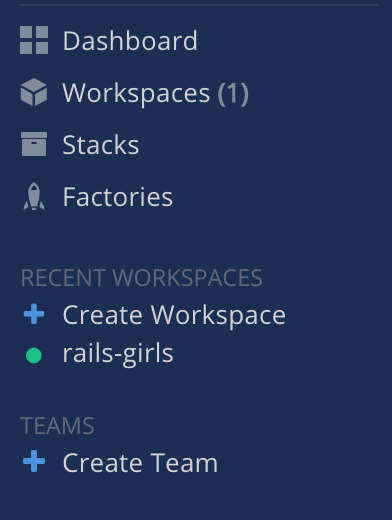 The Ruby on Rails Workspace has all the software we need for the workshop already preinstalled. 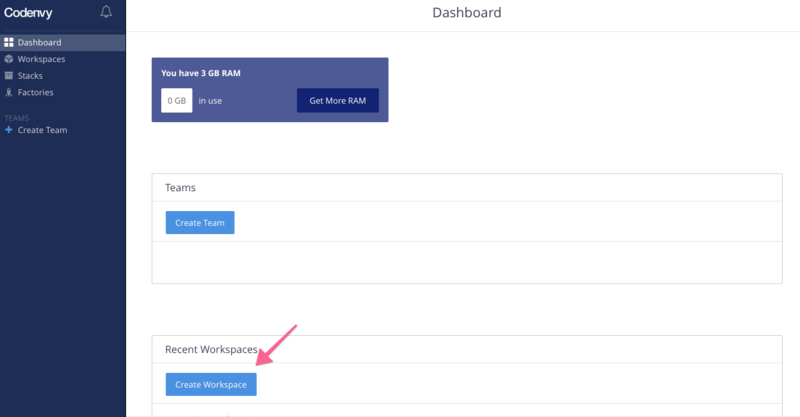 To create a workspace, log into codenvy.io and click on ‘Dashboard’. If no workspace has been created yet, the ‘New Workspace’ view is displayed. In the ‘New Workspace’ view, a few settings have to be made. Give the workspace a name of your choice. In the example this is “railsgirls”. 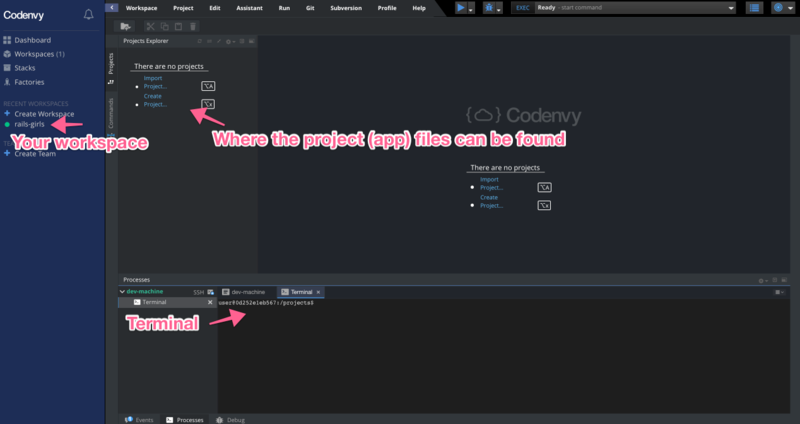 Codenvy creates a folder ‘/projects’ during initialization, in which you can later put your code. If you haven’t used your workspace or projects in a while, they might have been shutdown due to inactivity. You will notice an empty circle displayed next to the workspace name. In this case simply click on the name of the workspace. It will then be restarted (which can take a while) and afterwards opened. If a guide or tutorial asks you to run a rails command that contains rails or rake, prepend bundle exec to this command, e. g. bundle exec rails db:migrate. Exception: the rails new command is not prefixed. For example, if the tutorial wants you to visit http://localhost:3000/posts, you would open the URL http://node3.codenvy.io:33079/posts instead.